South Korea’s Navy launched its fourth 1,800-ton Type 214 submarine in a ceremony here on Tuesday as part of efforts to boost its underwater warfare capabilities against North Korean submarines. The ship, named after Korea’s famous independence fighter Kim Jwa-jin (1889-1930), is the fourth of its kind in operation since 2010. Kim is Korea’s first general of independence fighters who led the Cheongsan-ri battle to defeat 3,300 Japanese soldiers in China’s northeastern region in 1920. President Park Geun-hye, Defense Minister Kim Kwan-jin and senior military officials attended the ribbon-cutting ceremony held at Daewoo Shipbuilding & Marine Engineering’s shipyard in Geoje Island, close to the southern port city of Busan. The late general’s daughter Kim Eul-dong, an incumbent lawmaker of the ruling Saenuri Party, and actor Song Il-kook, his grandson, also attended the ceremony. The ship can hit 300 targets simultaneously, and is equipped with ship-to-land missiles and torpedoes as well as an advanced sonar system for anti-submarine warfare, surveillance and reconnaissance missions. The diesel-powered submarine is operated by Air Independent Propulsion (AIP), which extends the ship’s submerged endurance compared to conventional submarines. The AIP system enables the crew to carry out underwater missions for several weeks without the need to access atmospheric oxygen. The Navy will take delivery of the attack submarine in late 2014 and deploy it in 2015 for naval operations, officials said. 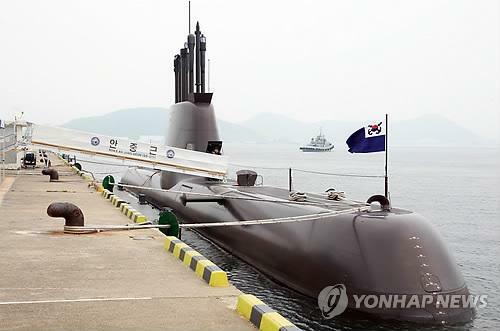 South Korea currently operates over 10 submarines, including 1,200-ton Type 209 subs and 1,800-ton Type 214 subs. The Navy plans to acquire nine 3,000-ton level heavy-attack submarines after 2020 with significant improvements in their radar and armament systems compared to their predecessors. North Korea is known to have about 70 submarines, one of which is suspected of having torpedoed a South Korean corvette in the tensely guarded western sea in March 2010. A total of 46 sailors were killed in the incident. This entry was posted in The world's submarines and tagged AIP, Air Independent Propulsion, Kim Jwa Jin, South Korea, Submarine, Type 214 on August 13, 2013 by jasonlockley. — Life aboard a submarine can be tough. Operations are hectic, quarters are cramped and the health of crew members can suffer as a result. Captain Hyun Chang-hoon used to have strong teeth before he joined the submarine fleet more than 20 years ago, but now the 47-year-old suffers from dental disease, which is a common health problem for veteran submariners due to the higher-than-normal amount of carbon dioxide inside a submarine. 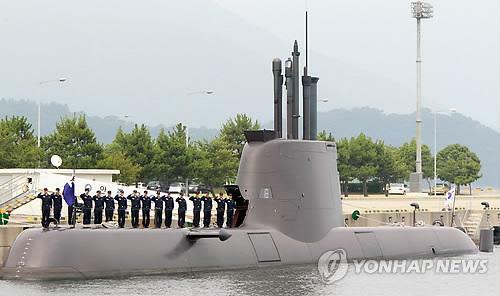 Hyun, the captain of a 1,800-ton submarine named after a famous independence fighter Ahn Jung-geun (1877-1910), was speaking of the intense lifestyle of soldiers in this unit during a Yonhap reporter’s visit to the ninth flotilla submarine base in the southeastern port city of Jinhae. Poor dental hygiene is just one of the hardships crew members face when living in cramped quarters for extended periods of time. “When I returned to home after completing months-long missions, I went to a public sauna to get rid of all kinds of body odor. But it didn’t go away,” said a vice admiral who had served in the submarine unit for nearly 30 years. Due to confined space, no women have been allowed in the unit since its establishment in the early 1990s. The Navy recently revealed the Type 214 submarine — the third of its kind in operation since 2010 — to give the public a very rare insight into various aspects of its weaponry, machinery, confined spaces and life aboard. The atmosphere in the unit is derived not only from the nature of its missions, which require about 40 men to remain together underwater in an iron tube for many long days, but also because very few soldiers serve in the unit. Secrecy and noise reduction is important to the submarine crew so they won’t be detected by the sonar of other submarines. Wearing boots with layers of soft-cushions on the heel is one way they reduce noise. 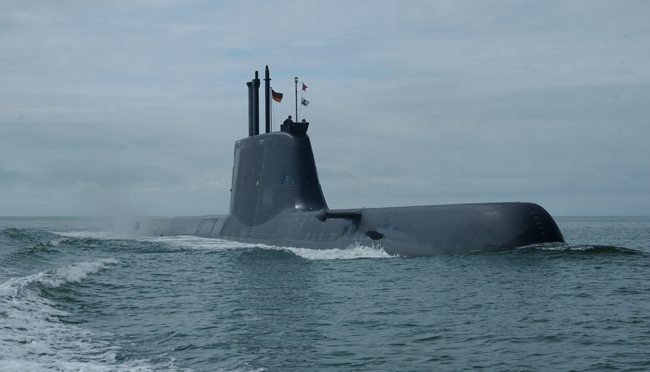 The Diesel submarine is operated by Air Independent Propulsion (AIP), which extends the ship’s submerged endurance compared to conventional submarines. The AIP system enables the crew to carry out underwater missions for several weeks without the need to access atmospheric oxygen. It is equipped with ship-to-land missiles and torpedoes as well as an advanced sonar system for anti-submarine warfare, surveillance and reconnaissance missions. The Navy plans to acquire nine 3,000-ton level heavy-attack submarines after 2020 with significant improvements in their radar and armament systems compared to their predecessors. A total of nine 3,000-ton submarines are expected to be built in South Korea with indigenous technologies, according to officials. By 2020, there will be over 20 ships operated by the Navy. As the flotilla is expected to receive more ships in coming years, it is due to become South Korea’s submarine headquarters in 2015. The procurement plan reflects the intensifying hidden underground battle with North Korea after a South Korean corvette Cheonan was sunk by a suspected North Korean submarine attack in March 2010. A total of 46 sailors were killed in the incident. Navy officials stressed the need to beef up the submarine capabilities, citing growing naval tensions around the Korean Peninsula that could turn into an armed conflict. China’s growing naval presence and Japan’s military build up to counter it also highlight the need for better anti-submarine warfare capabilities, they said. “We will play a key role in deterring North Korea’s naval provocations and protect national interests in the deep sea,” Hyun said. The biggest challenge for that goal is attracting and retaining skilled officers and crew members, as fewer cadets have applied for the intense submarine unit in recent years as the recruiting system was changed. When the flotilla was first launched two decades ago, top-ranking cadets were selected for the submarine program and joined the ranks of the submarine flotilla to operate strategic naval weapons against North Korea. The communist country has operated a large submarine fleet since the 1960s. After the recruiting system came under criticism for depriving cadets the opportunity to choose other units, the Navy now accepts applications for volunteers who want to become submariners. Instructors say they have difficulties enticing cadets and non-commissioned officers in joining the crew. To tackle the manpower problem, the Navy is seeking to increase the pay of submariners, but receiving more government funding is no easy task, said a Navy captain in charge of the submarine training unit. “We need more crew with in-depth knowledge and passion for the role submarines are expected to play in maritime strategy,” Hyun said. This entry was posted in The world's submarines and tagged South Korea, Type 214 on August 4, 2013 by jasonlockley.